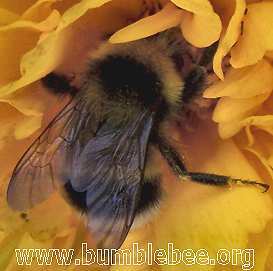 Bombus hortorum has a long head and a slimmer body than B. terrestris/lucorum. While flying between flowers that are close together, e.g. foxgloves the bee often keeps her long tongue extended. Body lengths, queen 17-20, workers 11-16, male 14-15. Bombus hortorum is rather similar in colouring to B. terrestris and B. lucorum workers. The main, and easiest to spot, difference is that B. hortorum has two bands of yellow hairs on its thorax. This can be seen on the bee above. In the photograph below the bee is on a dandelion, this is because I put her there to show her long legs. B. Hortorum prefers flowers such as red clover, cowslips, foxglove, vetches and lavender. The workers and males are just slightly smaller than the queen. 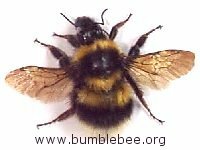 B. hortorum has the longest tongue of any bumblebee in the UK, it is usually around 1.5 cm long, but some bees can stretch to over 2 cm. This means that it can forage on flowers that have deep corollas that would keep out other bees. You will hardly ever see it on open or daisy type flowers unless it is gathering pollen. 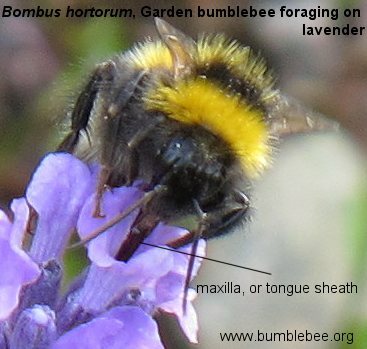 In the photograph above the worker is drinking nectar from a lavender flower, and doesn't need to use the whole tongue length or even stick herr head into the flower as other bumblebees would have to. Below left is another worker foraging off viper's bugloss. You can see the reflection from her empty pollen basket, showing that she is either at the start of a foraging trip, or that she is concentrating on nectar only. 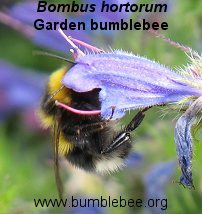 Viper's bugloss is very popular with long-tongued bumblebees, and is a very pretty flower to have in the garden. I can highly recommend it to anyone gardening for bees. Below you can see a close-up of the, long narrow head of a worker. 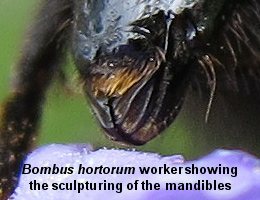 B. hortorum have a longer head than other species, and this combined with their long tongues enables them to forage from flowers other bees cannot reach. 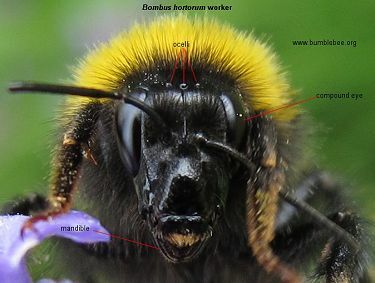 In this photograph the compound eye can be clearly seen as can the 3 ocelli which are arranged in the triangular pattern common in all bumblebees. 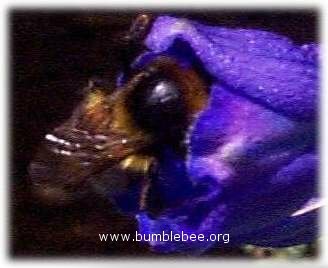 The mandibles (jaw) above and below clearly show that they, and indeed any bumblebee is incapable of doing much more than forming wax. The photograph below was taken just below the Eiffel Tower in Paris. It shows a rather ragged hortorum worker. Her thorax has a large bald patch on which the light is shining. I have noticed that hortorum tend to have more balding workers than other species. This may be because they specialize in the more complicated flowers, often disappearing entirely within the flower, and rubbing their back against the flower. Or it may be that they rub against things more when entering their nest. Or perhaps they are just prone to premature baldness! 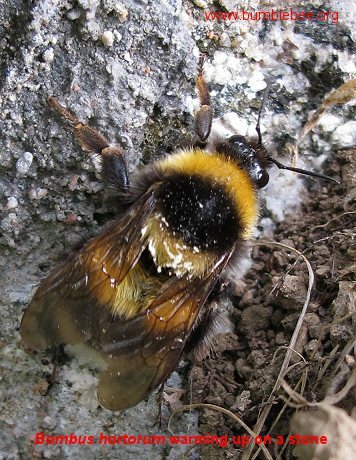 The photograph above was taken on a cold and windy day and shows a Bombus hortorum worker warming up on a stone just by some flowers she was foraging from. The sun had warmed the stone so it was warmer than the surrounding air. The cream-coloured stuff on her hair is pollen. Below is a male who has spent the night in this flower. When I came across him it was early morning and he was cold and could barely move. He would soon return to normal once he drank some nectar and allowed the sun to warm him up. All bumblebee males patrol mating circuits laying down a pheromone to attract new queens. Usually they patrol a species specific heights, and Bombus hortorum males patrol at less than one metre from the ground. Bombus hortorum colonies are fairly small and short-lived with an average life of around 14 weeks, and along with pratorum they have a reputation for nesting in "unsuitable" places such as coat pockets, buckets and inside lawnmowers, their preferred nest sites are usually on or just below ground. 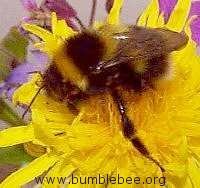 They are fairly placid bees and do not have large nests, so if it is possible, it is best to leave them where they are. If you must move the nest, for example, if it is inside a lawnmower, then do so late in the evening when all the bees have returned. Get as much of the nest material as you can into a small box with an entrance hole of about 1 cm and leave it inside as close to the original spot as possible. If it is inside a shed or building then any kind of container will do. If it has to be moved outdoors then the container must be weatherproof and placed in a south-facing sheltered spot. The cuckoo species of B. hortorum is B. barbutellis. 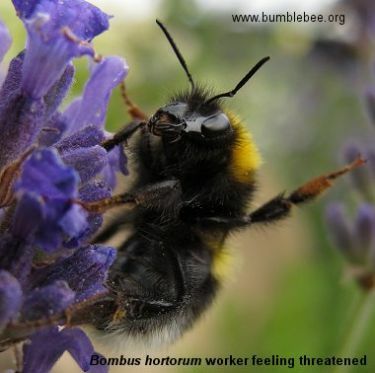 The photograph below shows the typical pose a foraging bumblebee will take when it is feeling threatened. She will stop what she is doing and raise one of her middle legs as a warning. In this case it was probably my camera strap waving about that annoyed her. As soon as I moved away she got stuck into the lavender again. Bumblebee.org (C) 1997 - 2018 contact/cookie info.